Geomagics is the catalyst of reverse engineering. 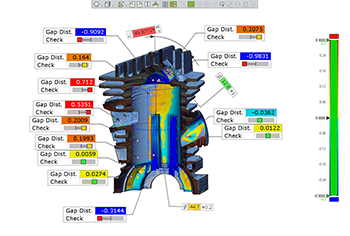 With Geomagics Design X, users can import scan data mesh files and create feature-based, edited solid models that work with your existing CAD platforms. Users who need to only design mating components that fit up to scanned part, can use the auto-surfacing tool to convert the scan data as is, to a solid model for designing up to and around the scanned component. The auto-surfacing tool only takes seconds, or minutes, not days compared to measuring parts with calipers and re-creating manually. Take your scanning and reverse engineering workflow to the next level and schedule a demo today! Improve your ability to investigate quality issues that may appear across parts or over time through the multiple results system and the Result Navigator. Identify the sources of stack up error in weldments or assemblies by simultaneously working with many results under different alignment scenarios, and derive meaningful, actionable information from the analysis. Understand potential assembled partrelated issues, using portable measuring devices, optical scanners and even computed tomography by collecting families of parts or an assembly into one inspection project for easy cross part referencing. Maintain a single project for a single part which contains all measurements over time, and graphically investigate cross supplier issues. New powerful reporting features in Geomagic Control X enable graphically-rich, communicative reports. Custom viewpoint control and view-style reporting empower you to make your report more closely follow a traditional paper or pdf print graphical presentation. Brand new, intelligent 3D dimensioning and annotation management processes enable you to control in fine detail how dimensions will be displayed. You can pick from some popular default representations or create personalized and customized annotation styles to match your company standard. New, advanced report layout tools give you the flexibility to choose how reports will be configured, in the format you prefer.